Tryin’ To Catch Me Runnin’ Dirty? 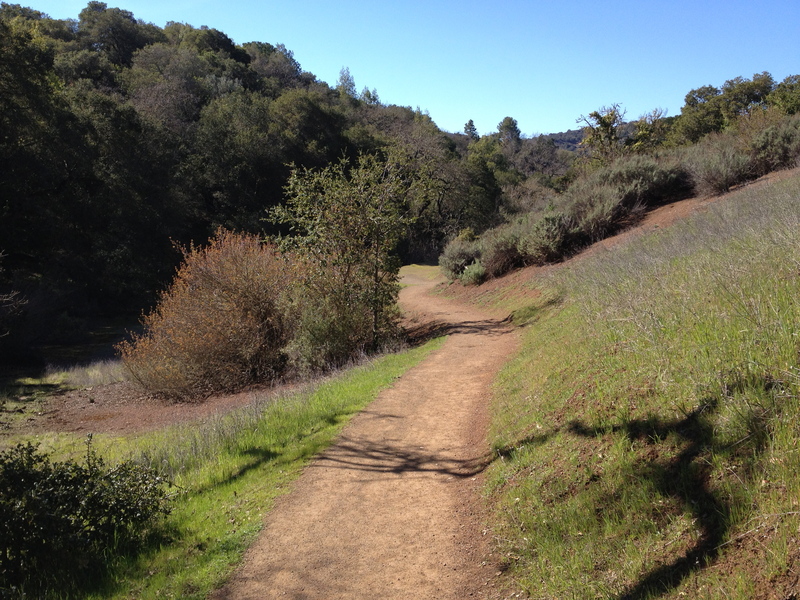 The Wildcat Loop Trail at the Rancho San Antonio Open Space Preserve offers a little bit of everything—meadows, woods, single-track, and plenty of climbs. 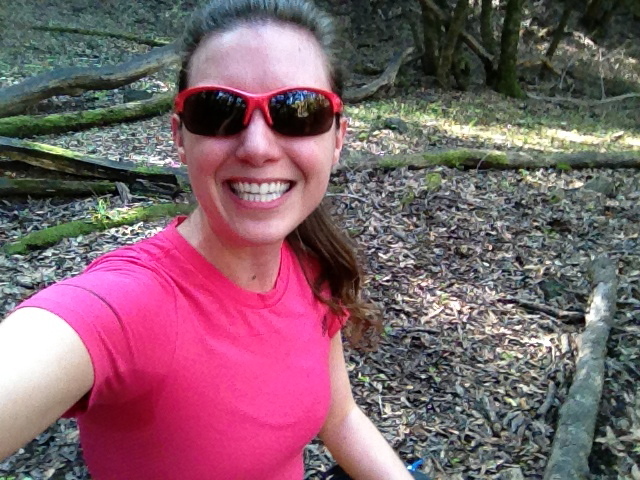 It got warm out there in the woods, so I stripped down to my pink t-shirt, which just so happens to match my sunglasses. Looking pretty while getting dirty—love that! A short, 25-minute drive from where I live, the preserve boasts more than 23 miles of trails for hiking, biking, and horseback riding. The website said the Wildcat Loop Trail was great for running, and it wasn’t kidding! I got in a fantastic 3-mile workout (plus the warm up and cool down jog from the car to the trailhead) and counted several other runners burning up the track out there, too. On a high after running on dirt, I signed up for another messy kind of experience when I got home. I’ve been invited to join Team Pretty Muddy and participate in the Pretty Muddy 5K in Sacramento, CA on June 29. This will be my first obstacle mud run ever—and I’m psyched to be able to share the experience with you. But instead of just reading along, I’d love for you to join me! You can get $10 off the registration fee if you sign up by March 1. Click to it already! Did you discover a new trail this weekend? Have you ever done a mud run? Guess Who’s Not Feeling Ready for Her Half Marathon Next Weekend? My mind isn’t there yet, but at least my feet will look confident in The North Face Single Track Hayasa sneaks! Surprise, it’s me. (Not really a big shock there, huh.) Between stressing out over work for the past month and coming down with a chest cold (gotta thank the boyfriend for that one—every time he gets on a plane he comes back with the sniffles! ), I’m not feeling super confident going into what should be a taper week for the upcoming The North Face Endurance Challenge Half Marathon at Bear Mountain. But thinking back on every single significant race I’ve ever participated in, I’ve never felt ready. The morning I toed the line in Hopkinton for the 2011 Boston Marathon, I was full of dread—I didn’t think I could handle the hills. Minutes before the gun went off for the 2010 Marine Corps Marathon I briefly considered crossing the barricades, finding my dad in the crowd, and telling him to drive me back home—I wasn’t sure if I had put in enough mileage. And in the first mile of the 2009 NYC Marathon I almost pulled over to throw up on the Verrazano Bridge—the anxiety over not being positive that I could complete 26.2 miles was making me nauseas. I finished all of those marathons. Clearly, my body was ready and this is all mental. Still, going into my first ever trail half-marathon presents new hurdles for my head. Did I run enough on actual trails to prepare my legs, ankles, feet, tendons, and muscles for the inconsistent terrain? Should I have practiced carrying my water bottle more? Was my training enough? Am I enough? My mantra for this week leading up to the race: “Yes, I am enough.” I have no doubt that I will finish all 13.1 of those woodsy miles on Sunday 6 May. It just might not be pretty. And I might be sniffling on the way home. What helps boost your pre-race confidence? Got any trail running tips? Next time I’ll pack some utensils I like to have oatmeal before long runs and races (I’ve mentioned my breakfast habits before), so I was ready with a packet of the instant kind. I used my in-room coffee pot to make hot water and filled a paper cup with oats. That’s when I realized I didn’t have a spoon. Unfortunately, the condiments box didn’t contain one either—just two sugars, two Splendas, and a packet of non-dairy creamer. If you had been in that hotel room with me at 5:45am, you would have seen me shoveling oatmeal into my mouth with the flat-ish end of my toothbrush. I am nothing if not resourceful. Runners want to see each other do well In the early miles everyone was smiling. Veterans were advising newbies to take it easy on the down hills. I heard a guy tell one young woman, “You’ll want to save strength for what’s coming.” And the pack around me got excited when spectators shouted updates on what was happening with the elite men and women up front. When the women’s race was won there was agreement that we were proud of Desiree Davila for setting the pace and proving that American distance runners are a force. Running a marathon looks like an individual effort from the outside, but if you’ve ever tackled 26.2 miles you know that it’s really a group achievement. We feed off of each other’s energy and sometimes a simple, “You’ve got this!” from the woman next to you is enough to get you to the next water table. Cherry popsicles are super tasty Somewhere around mile 15 I got a craving for an ice-cold Coca-cola. (The last time this happened I was doing a half marathon that ended in Coney Island, which is practically the fountain soda capital of New York.) Annoyingly, the thought popped into my head that no one would have a Coke waiting for me at the finish and I couldn’t get rid of it—it consumed me for several minutes and no amount of singing “Sweet Caroline” would push it away. It was a very negative segment of the run for me. But then, just beyond the 20 mile marker, I spotted a line of kids, each holding out a colorful ice pop and cheering “Go runners!” with the most adorable New England accents (I love how they barely hit their R’s). I reached out, shouted “Yay! Cherry!” and was happy again. Boston, I will find my way back to you I now understand why so many runners are obsessed with the Boston Marathon. The course is incredibly hard, but it doesn’t leave you with a “one and done” feeling. Sure, the second I crossed the finish line (right before I started gagging) I thought, “Thank God that’s over with.” And a few hours later, when my legs went into spasm-y cramps after I tried to cross them at the dinner table, I couldn’t fathom putting myself through those 26.2 miles again. But the challenge of it sneaks back into your mind and suddenly you find yourself thinking about how you’ll train differently next time, wondering what mile 18 would have felt like if you had gone 10 seconds slower in the early miles, and how you might have benefitted from one more GU. At the Boston Athletic Association‘s Champions Breakfast on Saturday morning, four-time winner Catherine Ndereba summed up the course perfectly when she said, “Experience is the best teacher.” Now that I know what to look out for, the next time I run Boston I’ll be more prepared. Set the next challenge immediately Finishing a marathon is kind of a letdown—suddenly the training is over and there’s nothing to look forward to anymore. That’s why it’s a good idea to have your next goal on the calendar before you let someone wrap you in a mylar blanket. On tap for me for the rest of the year: The Hope & Possibility 5-Miler to benefit Achilles in New York City in June, the Hood To Coast Relay in Portland, Oregon at the end of the summer, and the NYC Marathon in November. And don’t think I won’t be adding more speed work into my routine in hopes of qualifying for the Boston Marathon. I’ll get there! Got any fun events on your calendar? What’s your next race goal? I did it! 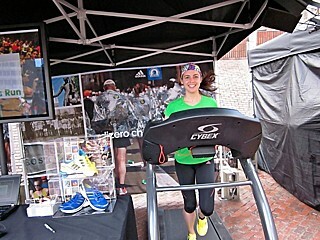 I ran the Boston Marathon on Monday and I’m still feeling a bit of a runner’s high. It was incredibly hard and I almost threw up at the finish line (my body was wiped out), but I want to do it again! 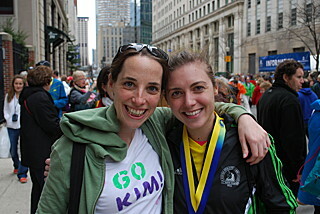 (Here’s a shot of me at the finish with my friend Emily—how cool is her t-shirt?) I have been thinking and dreaming about the course and how I will approach it next time. But first, I should tell you how it all went down for me this past weekend. 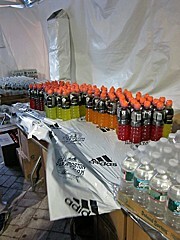 I managed to snag an invite to the Boston Athletic Association’s Champions Breakfast on Saturday morning (thanks, Adidas! 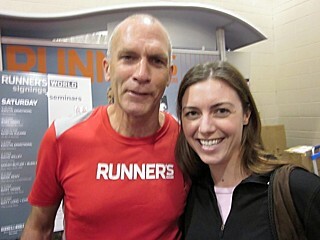 ), where I mingled among Boston Marathon greats. I was sitting next to ten-time wheelchair winner Ernst Van Dyke, and I could have lobbed my banana muffin into the lap of Joan Benoit Samuelson with little to no effort. On stage, running legends shared their memories of marathons past and I teared up when they showed a video of Amby Burfoot (1968), Ron Hill (1970), Alvaro Mejia (1971), Bill Rodgers (1975, 1978-80), Jack Fultz (1976), Greg Meyer (1983), Joan Benoit Samuelson (1979, 1983), Lorraine Moller (1984), Geoff Smith (1984-85), Rob de Castella (1986), Uta Pippig (1994-96), and Catherine Ndereba (2000-01, 2004-05) crossing their respective finish lines. It was inspiring to say the least. After that it was back to my hotel room, where I spread out all of the running clothes I had brought and tried to figure out exactly what to wear for the marathon. I went with the pink top, gray shorts, and black Vitalsox compression socks. In the morning, I ran two miles for Grete Waitz’s Norwegian organization Aktiv Mot Kreft (Active Against Cancer). Adidas had put together a charity event for the weekend. They set up treadmills in various spots around Boston (City Hall Plaza, Faneuil Park, and at the Hynes Convention Center) and encouraged runners of all abilities to log miles for worthy causes—participants were able to choose from two local Boston programs and Aktiv. I hung out with my amazing family for the rest of the day. It wasn’t the whole clan, but I had quite the band of cheerleaders: My dad and his wife flew in from Virginia, my uncle Mark came up from Dallas, my Aunt Jill and cousin Kara drove in from Saratoga, NY, and cousins Alex from D.C., Casey and Ian from Brooklyn. We all convened at the home of my cousin Logan, her husband Will, and their ridiculously adorable baby Reid. 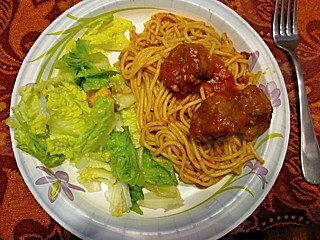 A big pasta dinner was served—the perfect pre-race fuel, as well as a dozen cupcakes from Sweet bakery with my bib number painted on in red icing. Yum! The 115th running of the Boston Marathon! Tune in tomorrow for my thoughts on actually running the Boston Marathon. To hold you over until then, here’s a sneak peak: runners are cool, hills are hard, and cherry popsicles should always be given out at mile 20. 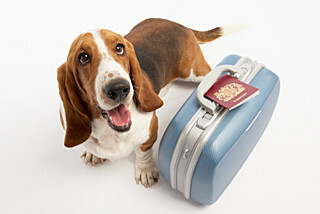 My suitcase is full and John Denver’s “Leaving On A Jet Plane” has been going through my head all morning. I’m off to Boston today! I’ll be spending the weekend with friends, family, and thousands of runners eager to see the dawn in Hopkinton for the start of the Boston Marathon on Monday. I’ve been getting mixed messages about the course. One friend says Heartbreak Hill is nothing to laugh at and to prepare for the worst, and another says it’s really not that bad and that I may not even realize I’m on it when I get there. But they all agree with the race strategy I got from Coach Neil: “Keep your pace under control, hold back until you get to Route 128, and from there run with abandon.” Control and abandon are now my Boston Marathon power words. 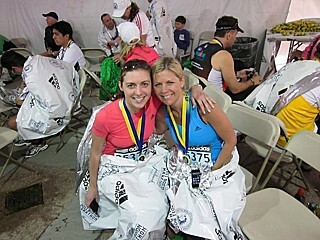 The next time you hear from me I will be a Boston finisher! I promise to feel every good thought you send my way on Monday—I’ll need them all to get through those tough 26.2 miles. I can’t wait to tell you about the experience! Countdown to the Boston Marathon: 3 days! Do you use power words to help you get through a tough workout? What are your big weekend plans? OK gang, I’m excited! So excited that I’ve been pushing the speed a little too much since last Thursday. The result: An angry left shin. But I’m confident that it won’t prevent me from finishing Boston—in 4 days! This morning I attempted to do four 1-mile repeats at race pace, but I’m so keyed up that I was about 10 seconds too fast. To circumvent the post-run throbbing in my shin I tried something new; I pulled on a pair of Vitalsox Performance Graduated Compression socks (seen here in this lovely photo provided by the company). One run certainly isn’t a scientific study, but I think these things really do stimulate circulation and improve muscle recovery—my legs felt springier, and my feet were super comfy. 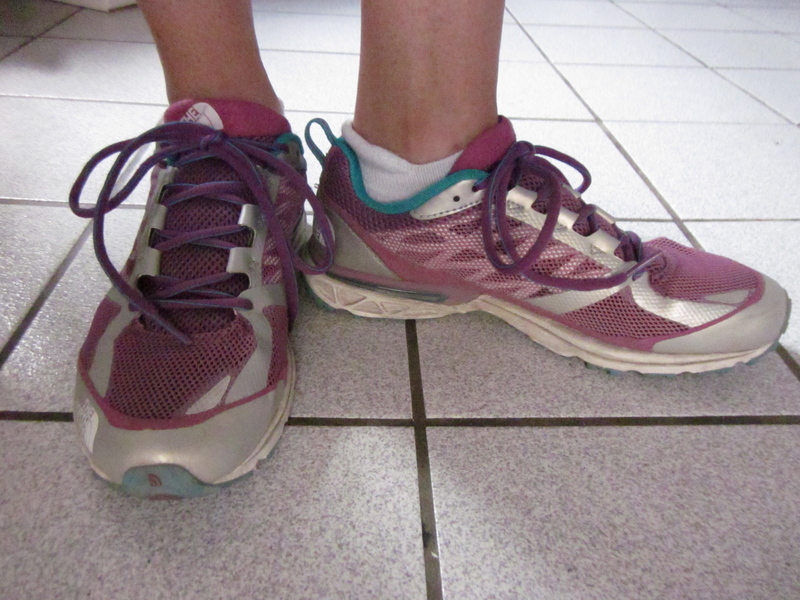 And even though they make me look more like a soccer player than a runner, I’m planning to wear them on the big day. 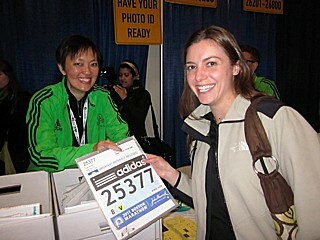 My marathon photos will all be keepers! 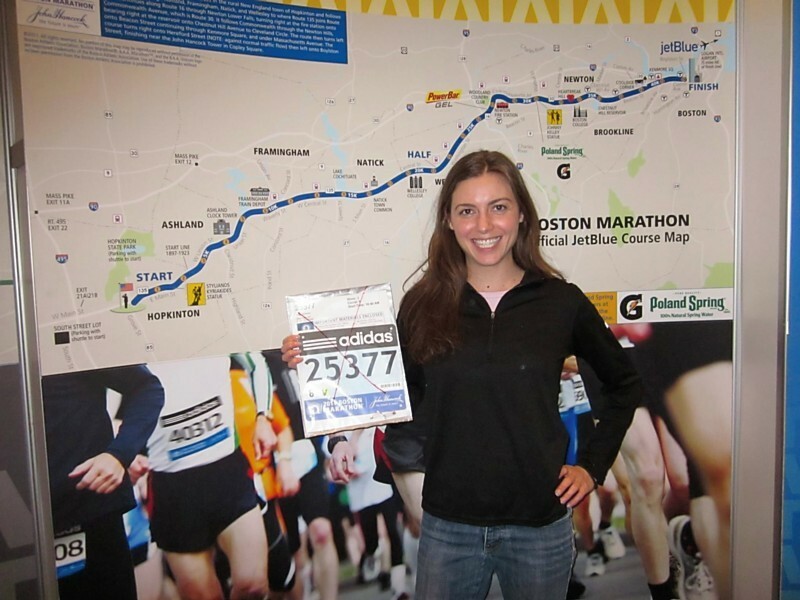 Countdown to the Boston Marathon: 4 days! 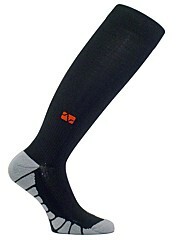 Have you ever tried compression socks? Are you as psyched as I am for Monday? I missed by bedtime last night because I was gabbing on the phone with a friend of mine who had spent the day giving birth (Baby Ashley, I’m so happy you’re finally here!). Not a bad reason to put off a date with Mr. Sandman. But when I did manage get under the covers, I had a really hard time falling asleep. The shut-eye came eventually and so did some very weird brain activity: I dreamt that my legs didn’t work. In the dream, I was standing in a race corral wearing baby pink sneakers and a garbage bag, wondering if it was going to rain. I heard a gunshot and the people around me took off running. But I just stood there. I couldn’t move. 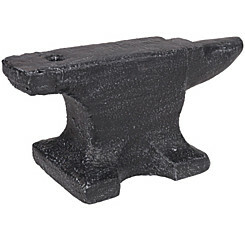 I tried to lift my right foot, but it was unbelievably heavy. In a panic, I reached down and tried to tug it out in front of me. Then I tried the left, but it wouldn’t budge either. I looked up again and could see the other runners fading into the distance ahead. I woke up in a pool of sweat. Anxiety dreams during taper week are totally common—at least that’s what NYC running coach and former Olympian John Henwood once told me. He says his clients have all kinds of fears in the days leading up to a marathon: What if I forget how to run? What if I break my leg going down the subway stairs? I sneezed this morning; do I have pneumonia? As funny as they sound, they can really mess with your head. When I stepped out of my apartment to run this morning, a touch of apprehension slipped in and I was concerned that my legs might feel like lead. What if the dream (nightmare!) had an ounce of reality? A few strides later I was breathing easy and laughing at myself. I really need to relax. 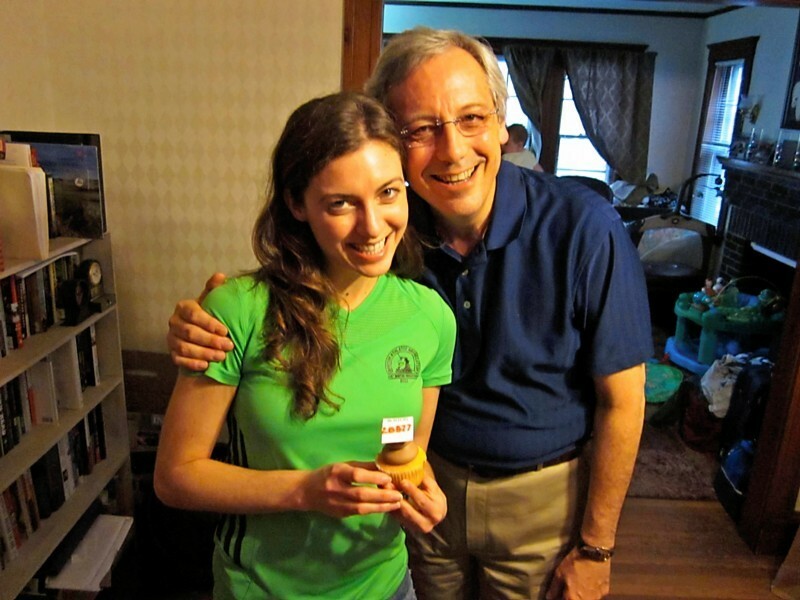 Countdown to the Boston Marathon: 6 days! Have you ever had the dream where your legs don’t work? What do you do to ease anxiety? And I think it’s helping me run faster. 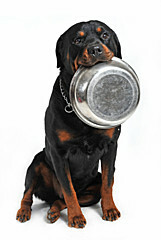 It started innocently enough when I met my friend Andy at Blue Dog Café in NYC last week. I walked into the sandwich and smoothie shop and he handed me a bottle of fresh pressed juice. Andy knew I had been under the weather, and I’m sure he just wanted to help. Little did he know I was addicted at first sip. The juice tickled my taste buds with apple, lemon, cayenne pepper, double ginger and something they call “immunity elixir,” and my sinuses were instantly open! Before leaving the café, I loaded up on Knight In Armor and two other blends: All Greens Plus (a mix of cucumber, celery, parsley, romaine, spinach, kale, apple, lemon, and ginger that’s surprisingly tastier than you’d think it would be) and Rejuvinator (a combo of carrot, beet, coco water, and lemon that leaves me feeling energized). After drinking them between meals, I kicked my cold and had some really great workouts—the mile repeats last Thursday and a really strong 10K race in Central Park yesterday. And now I’m jonesing for more juice. 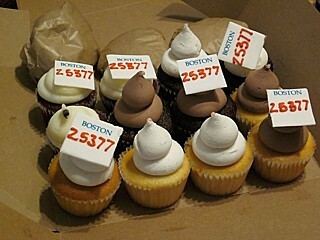 Countdown to the Boston Marathon: 7 days! Have you ever tried drinking your veggies? 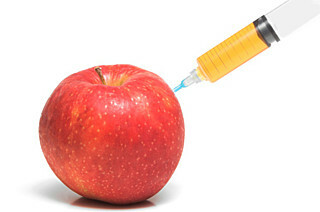 Do you have a juicer at home? What helps you feel revved up? Last night I was planning to do a few mile repeats at my marathon goal pace, but my legs felt like going faster so I went with it. I crushed those miles, running over a minute faster than planned! It felt incredible to push my body hard and realize I didn’t lose any speed over the past few flu-induced easy weeks. But my legs were a little stiff this morning, so I spent some time stretching on my living room floor. Experts still can’t agree on whether or not stretching reduces a runner’s risk of injury, and no one can give me a straight answer on when to do it—before a run or after? But it feels good and I like to incorporate it into my routine on mornings when I’m not doing cardio. I prefer active stretching, using a yoga flow technique that keeps my muscles moving—as opposed to just reaching and holding, which can lead to cramps. A couple of sun salutations and a pigeon pose or two really works out the tightness in my quads, hamstrings, calves, and hip flexors. Countdown to the Boston Marathon: 10 days! What are your favorite stretches? Have you ever tried yoga?